ZK series CCD rice sorting machine adopts the most advanced CCD sensor technology and high speed micro spraying value to achieve the different qualified rice grains sorting process. The whole machine is composed of feeding system,conveying device,sorting system,air-operated system,discharging device and machine body. All parts could efficiently work together without no barriers. Only do you easily operate the control cabinet, and the sorted grains will be accomplished very high effectively. This machine can identify the 0.8mm scope of Heterochromatic areas for the rice of light yellow, micro color spot and tiny black point. 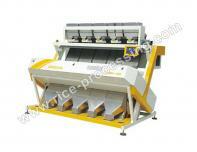 1.Automatic shaking feeder and various types of chute keep the rice flow even and uniform. 2.Digital operating cabinet make the interface very friendly and flexible. 3.Advanced optical design gives your diversified sorting models. 4.High sensitive CCD sensor guarantees sorting effect more precise. 5.Energy and vapor is more economic, the high sorting accuracy and lower out of proportion. 6.High integrate and speed digital processing system promise best sorting effect and reliable performance. Our company is specialized exporter, manufacturer and supplier of ZK Series CCD Rice Sorting Machine in 中国.